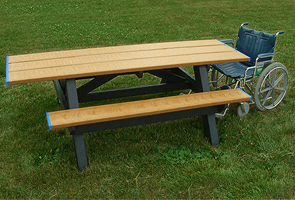 This step over picnic table has the appearance of the traditional wood picnic table but is constructed with 100% recycled plastic for a more environment friendly touch. Recycled plastic is weather resistant, easy to clean, and won't splinter. Slats are available in the wide variety of colors shown. 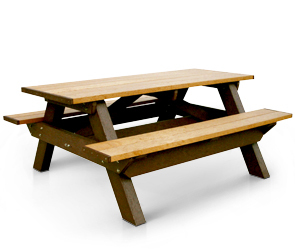 Heavy-Duty 4" x 6" legs provide the kind of durability needed in any recreational setting. Tables are available in either 6' or 8' lengths. Table top and seats come with either 2" x 10" or 2" x 6" width planks depending on the length table you select. Wheelchair accessible tables are also available, and are identified "Universal Access" by a blue end cap. Table is secured with all stainless steel fasteners.